At the PVM Family Program Series event held October 5 in Lynn Hall, Room 1136, Dr. Christina Wilson built kidneys, brains, and other organs out of playdough with help from the kids in attendance, and showed them where the organs are located on humans and where they are located on dogs, using a skeletal model. Led by Dr. Christina Wilson, clinical associate professor of toxicology in the Department of Comparative Pathobiology and head chemist in the Animal Disease Diagnostic Laboratory, the first PVM Family Program Series event of the semester was a hit! A total of 24 adults and children ages 2-11 years old were in attendance for the presentation titled, "Keeping Your Pets Safe during Fall Season Fun!" held on Thursday, October 5 in Lynn Hall, Room 1136. Dr. Wilson shared fun fall facts and discussed ways to keep curious pets safe during the fall season from seemingly harmless items lying around the house. She explained that even though socks keep our feet warm during the chilly fall weather, they can be dangerous to animals who sometimes eat things they shouldn't, like the Great Dane who ate 43 socks and needed surgery to have them removed — a case which Dr. Wilson illustrated with a bag of socks from her home and an x-ray of the dog's stomach full of socks. Kids in attendance received a free bag of goodies and Dr. Wilson went through each item explaining how each one could be harmful to pets. Examples included a little rubber snake, which Dr. Wilson used to illustrate how dogs can be curious and chase after snakes that are on the move to hibernate during the fall season and may get bitten; a glow stick, which can cause hypersalivation in cats and dogs; and playdough, which Dr. Wilson used to explain how homemade playdough contains a lot of salt and can cause salt poisoning in pets. 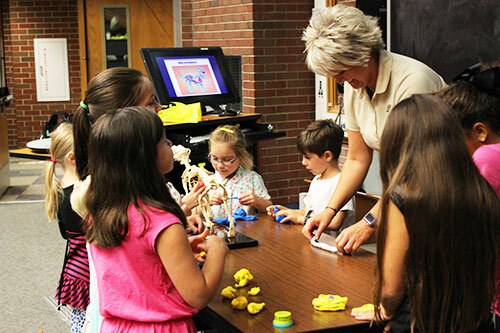 Developed by Purdue Veterinary Medicine's Office of Engagement, the PVM Family Program Series offers children a chance to learn about the many facets of veterinary medicine with fun interactive presentations hosted monthly in Lynn Hall from October to December and again from March to April. Geared toward children in kindergarten through fourth grade, the events are free and open to the public, including older children, but registration is requested. Dr. Paulo Gomes, clinical assistant professor of dermatology in the Department of Veterinary Clinical Sciences, will host the next PVM Family Program Series event on Thursday, November 2, from 6:00 — 7:00 p.m., with a presentation titled, "My Dog Has a Dermatologist!" Contact the Office of Engagement (pvmengaged@purdue.edu) to register. Click here to learn more about the PVM Family Program Series and upcoming events.